Cursed, and living in a self-imposed isolation, Dr. Jared Fields simply existed in the mountains he called home. He lived with the knowledge that the hideous scars and lumps that marred his face frightened people, and turned patients away. The fact that he had been turned into a shifter at night simply allowed him to escape these harsh realities for a time. Anna Stodger was the sole survivor of a plane crash, and wouldn't have been alive without the help of Jared. He rescued her from the wreckage, then cared and treated her wounds. The only thing he could not heal was her sight. Jared cherishes the time Anna is with him, but he realizes that it cannot last. Anna would need to leave the mountain, and he could not go with her. Also, if her sight were to return, he knew she would not want to remain with a monster such as he. 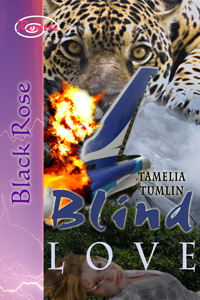 Blind Love delivered a new paranormal twist to the Beauty and the Beast romance. I always have a soft spot for a wounded hero, and Jared is wounded both physically and emotionally. Anna is the perfect heroine for him. My only problem was not understanding why, when there had been a plane crash, the area wasn't swarming with emergency crews and investigators. I expected her to be involved in interviews and absolutely being removed to a hospital. By the end of the book, I assumed that this story is set almost in an alternate reality, but a little more insight to this at the beginning would have helped.